The 2016–17 Bundesliga was the 54th season of the Bundesliga, Germany's premier football competition. It began on 26 August 2016 and ended on 20 May 2017. Bayern Munich were the defending champions. Fixtures for the 2016–17 season were announced on 29 June 2016. Bayern Munich won their 26th Bundesliga title with three games to spare, becoming the first team to win 5 consecutive titles. RB Leipzig became the runners-up, only a year after its promotion last season from the 2015–16 2. Bundesliga. A total of 18 teams participated in this edition of the Bundesliga. VfB Stuttgart and Hannover 96 were relegated to 2016–17 2. Bundesliga. Former Bundesliga champion Stuttgart were relegated to the second level after 39 years, whereas Hannover 96 finished a 14-years stint in the top level. They were replaced with 2. Bundesliga champion SC Freiburg and 2. Bundesliga runner-up RB Leipzig. Freiburg immediately returned to the Bundesliga, whereas RB Leipzig makes its debut. Finally Eintracht Frankfurt, 16th of Bundesliga faced 1. FC Nürnberg, third of 2. Bundesliga in a Bundesliga play-off. Eintracht won 2–1 on aggregate and remained in the top level. RB Leipzig was the first team from the former East Germany to play in the Bundesliga since the relegation of Energie Cottbus after the 2008–09 season. Rules for classification: 1) Points; 2) Goal difference; 3) Goals scored; 4) Head-to-head points; 5) Head-to-head goal difference; 6) Head-to-head away goals scored; 7) Away goals scored; 8) Play-off. 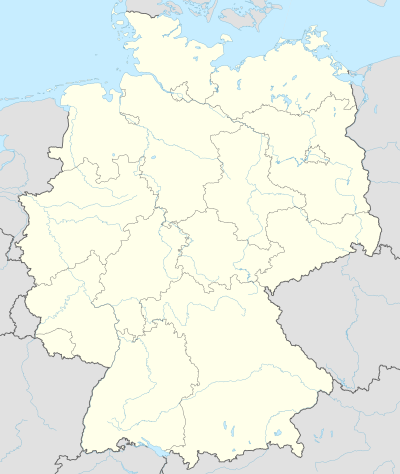 ^ a b Since the winners of the 2016–17 DFB-Pokal, Borussia Dortmund, qualified for the Champions League based on league position, the Europa League group stage spot was passed to the sixth-placed team, Hertha BSC; and the Europa League third qualifying round spot was passed to the seventh-placed team, SC Freiburg. VfL Wolfsburg won 2–0 on aggregate and both clubs therefore remained in their respective tiers for the 2017–18 season. ^ a b c d e f "ESPN FC 2016-17 Bundesliga Statistics". ESPN FC. Retrieved 29 August 2016. ^ "The new 2016/2017 Bundesliga and Bundesliga 2 schedule". bundesliga.com. 23 June 2016. Retrieved 23 June 2016. ^ "Bayern Munich seal Bundesliga crown for record fifth straight year". ESPN. 1 May 2017. Retrieved 3 May 2017. ^ "Bayern Munich seal fifth consecutive Bundesliga title with Wolfsburg win". Guardian. 1 May 2017. Retrieved 3 May 2017. ^ "Dortmunder Stadion wird ausgebaut" (in German). Sport1. 16 July 2015. Retrieved 17 July 2015. ^ "RheinEnergieSTADION". rheinenergiestadion.de. Kölner Sportstätten GmbH. Retrieved 29 December 2015. ^ "Verein". dierotenbullen.com (in German). Leipzig: RasenballSport Leipzig GmbH. n.d. Retrieved 12 May 2016. ^ "Schalke erhöht Stadionkapazität". kicker.de (in German). Kicker. 30 June 2015. Retrieved 20 July 2015. ^ a b c "Schuster kommt, Weinzierl geht". fcaugsburg.de. 2 June 2016. ^ a b c d e f g h i j k l m ONLINE, RP. "Bundesliga 15/16: Die Kapitäne der 18 Klubs". RP ONLINE. ^ a b c d e f g h i j k l m n o p "Trikotsponsoren und Ausrüster - bundesliga.de - bundesliga.de". bundesliga.de - die offizielle Webseite der Bundesliga. ^ a b c d e f g h ONLINE, RP. "Überblick: Die Verträge der Bundesliga-Trainer". RP ONLINE. ^ "Jako Bayer Leverkusen 16-17 Home Kit Released". footyheadlines.com. Footy Headlines. 5 February 2016. Retrieved 25 April 2016. ^ "BVB Tweet 26 August 2016". ^ "Gladbach name Schubert permanent head coach". bundesliga.com. 13 November 2015. Retrieved 13 November 2015. ^ "New Coach Niko Kovac". eintracht.de. Retrieved 8 March 2016. ^ "Freiburg 16-17 Home Kit Leaked". footyheadlines.com. Footy Headlines. 2 May 2016. Retrieved 3 May 2016. ^ "Julian Nagelsmann takes over as first-team coach". achtzehn99.de. 10 February 2016. Retrieved 11 February 2016. ^ a b c d "Trainerwechsel beim FCI: Hasenhüttl geht nach Leipzig, Kauczinski übernimmt". dfb.de. 6 May 2016. Retrieved 6 May 2016. ^ a b "Fix: Markus Weinzierl wird Trainer beim FC Schalkr 04". Retrieved 2 June 2016. ^ "VfL Wolfsburg to Announce €80m Nike Kit Deal + 16-17 Kit Info Leaked". footyheadlines.com. Footy Headlines. 30 April 2016. Retrieved 9 May 2016. ^ "Andre Breitenreiter: Ein emotionaler Tag". espnfc.com. schalke04.de. 14 May 2016. ^ "Weinzierl bestätigt Trennung vom FC Augsburgwebsite". kicker.de. 24 May 2016. Retrieved 24 May 2016. ^ "Norbert Meier neuer Darmstadt-Trainer". dfb.de. 10 June 2016. Retrieved 10 June 2016. ^ "Interims-Coach Nouri übernimmt für Skripnik". werder.de. 18 September 2016. Retrieved 18 September 2016. ^ "Nouri steigt zum Werder-Cheftrainer auf". werder.de. 2 October 2016. Retrieved 2 October 2016. ^ "HSV beurlaubt Trainer Labbadia". hsv.de. 25 September 2016. Retrieved 25 September 2016. ^ "HSV's head coach is Markus Gisdol". hsv.de. 25 September 2016. Retrieved 25 September 2016. ^ "Einvernehmliche Trennung". vfl-wolfsburg.de. 17 October 2016. Retrieved 17 October 2016. ^ "Ismaël wird Cheftrainer beim VfL Wolfsburg". spiegel.de. 6 November 2016. Retrieved 6 November 2016. ^ "FCI und Trainer Markus Kauczinski trennen sich einvernehmlich". fcingolstadt.de. 6 November 2016. Retrieved 6 November 2016. ^ "Maik Walpurgis wird neuer Cheftrainer der Schanzer". fcingolstadt.de. 12 November 2016. Retrieved 6 November 2016. ^ "Torsten Frings wird Trainer bei Darmstadt 98" (in German). Süddeutsche Zeitung. 30 December 2016. Retrieved 30 December 2016. ^ "SV Darmstadt 98". kicker.de (in German). kicker. Retrieved 29 December 2016. ^ "Former Germany international Torsten Frings named Darmstadt head coach". ESPN FC. ESPN. PA Sport. 27 December 2016. Retrieved 30 December 2016. ^ "Augsburg entlässt Trainer Schuster". dfb.de. 14 December 2016. Retrieved 14 December 2016. ^ "Baum steigt in Augsburg zum Cheftrainer auf". dfb.de. 28 December 2016. Retrieved 28 December 2016. ^ "Borussia trennt sich von Trainer André Schubert". borussia.de. 21 December 2016. Retrieved 21 December 2016. ^ "Hecking neuer Trainer in Gladbach". dfb.de. 22 December 2016. Retrieved 22 December 2016. ^ "Wolfsburg trennt sich von Trainer Ismael". dfb.de. 26 February 2017. Retrieved 26 February 2017. ^ "Andries Jonker neuer Trainer in Wolfsburg". dfb.de. 27 February 2017. Retrieved 27 February 2017. ^ "Leverkusen trennt sich von Coach Schmidt". dfb.de. 5 March 2017. Retrieved 5 March 2017. ^ "Korkut neuer Trainer in Leverkusen". dfb.de. 6 March 2017. Retrieved 6 March 2017. ^ "Ligaverband: Ligastatut" [League Association: League Regulations] (PDF). DFB.de (in German). German Football Association. p. 214. Retrieved 16 August 2016. ^ "Scorer". Bundesliga (in German). Deutsche Fußball Liga. Retrieved 17 September 2016. ^ "1. Bundesliga: Die weiße Weste. Der Torwart-Award" [Bundesliga: The white kit. The goalkeeper award.]. kicker.de (in German). kicker. Retrieved 1 October 2016.